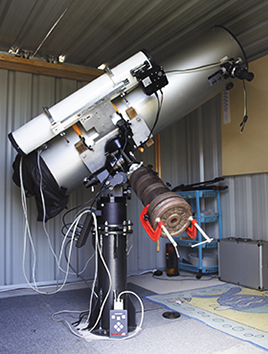 Located under southern Australian skies, our backyard observatory is under dark skies in the state of NSW, Australia. 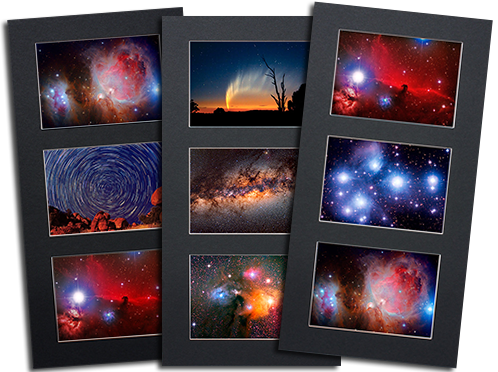 We are currently touring the Australian outback with our portable astrophotography telescope looking for dark skies to photograph the universe. The primary imaging telescope (the one used to take photos) is a customised 305mm (12-inch diameter) Newtonian reflector telescope with a fast photographic f/ratio of f/5. When teamed with a Multi-Purpose Coma Corrector (MPCC) from Baader this telescope is ideal for deep-sky photography. The telescope made by GSO Optical was supplied by The Binocular & Telescope Shop as a dobsonian telescope. I then took the optical tube assembly and modified it to better suit astrophotography. The modifications consisted of improving the telescope's image contrast by installing light baffles inside the telescope tube which improved the contrast tremendously, both visually and photographically. Other modifications included stopping stray light from entering the telescope around the focuser mount and especially the primary mirror mount. The final extreme modification required the telescope optics to be moved 48.5 mm closer together so that an attached camera and its adapters would reach the telescope's prime focus plane. I did this by shortening the optical tube length and remounting the primary mirror mount. There was little choice as the primary mirror mount also fits over the end of the telescope tube, like a structural lid, cutting 48.5mm off of the tube length was the only choice aside from resorting to another mirror mount. The primary telescope was then fitted with a 2-inch Crayford-style focuser that has a 10:1 micro-focus adjustment and 2-inch camera adapter. Perfect focus is achieved using a Bahintov Mask. This entire collection of equipment is all mounted to the top of the Losmandy G-11 equatorial mount with brackets and fittings that I made myself. The Losmandy saddle plate is replaced with my own 12mm thick aluminium plate which uses all six mounting holes on top of the equatorial head. This large aluminium saddle-plate seats two hand made tube seats which then seat the optical tube assembly (OTA). The OTA is then held in position with luggage rack straps which are tension adjustable enough to crush the OTA, they certainly do a good job of holding the OTA in position. The imaging camera is a 8 Mega-pixel thermo-electrically cooled Canon 350D Digital SLR camera modified for astrophotography work. I modified the camera by removing the manufacturer's filter over the image sensor and replaced it with a clear optical glass filter that I purchased from Edmund Scientific. This modification permits the camera to see further into the spectrum where objects like nebula emit their light. In addition the camera is thermo-electrically cooled which reduces the amount of electronic noise in long exposures. The guidescope is an old Meade branded 4.5-inch f/9 Newtonian reflector that I originally purchased from a local optics dealer many years ago. The guidescope is mounted and pointed with Bonney Lake Astro Works 5.5" guidescope rings and a modified dovetail rail intended for a 10" Schmidt-Cassegrain telescope that I fitted to my own docking plate. Usually the guidescope is used with a 1.8x Televue Barlow lens for more accurate guiding at f/16. The German-style equatorial mount is a Losmandy G-11 mount equipped with Gemini Goto servo motors. Telescope pointing is controlled by STAR Atlas:PRO Astronomy Software running on a nearby laptop computer. The autoguider is a thermoelectrically cooled SBIG ST-402 CCD camera mounted on the 4.5-inch guidescope with a 1.8X Televue barlow lens for guiding at f/16. Autoguiding is controlled via a USB connection using SIBIG CCDSoft software. The Baader Multi-Purpose Coma Corrector (MPCC) is a must-have for this telescope if you want pin-point star images across the field of view. Currently the only filter I use is a 2" Baader UV/IR Rejection Filter which stops the infra-red spectrum reaching the camera. Infra-red causes stars to appear bloated on images and ultra-violet can cause hallows around bright stars. I built the observatory from a flat roof heavy gauge 2.4m x 3.0m garden shed. I was careful not to choose a garden shed made from dozens of small panels, rather I selected a manufacturer who provided each wall as a complete panel so that the complete shed is only 5 panels (each wall and the roof). I split the roof into two halves, each side of the roof slides open partially or fully. Castor wheels fitted to the underside of the roof, travel up a carved timber beam when the section of roof is pulled open. This has the effect of lifting the roof off the walls and carrying the roof weight on the wheels so that the roof easily slides open. When the roof is pushed closed the wheels travel down the timber channel so that the roof perfectly sits on the walls just as it completely closes. The roof is then latched down to a 100x25mm timber beam that is ramset around the inside perimeter of the observatory walls. Truss angle brackets also join these beams at the corners. This makes the entire observatory very rigid and strong, particularly when the roof is off. Once the roof is closed, a number of gate-lock latches are used to secure the roof to the inner perimeter beam. The walls of the observatory are sealed from the inside with clear weatherproof sealant and the roof is sealed to the walls using foam inserts cut and glued into position. During extreme wind conditions a 3 metre long 150x50mm treated pine timber plank is placed on the roof to assist the roof in remaining where it belongs. The telescope is also covered with a weatherproof raincoat that covers the entire telescope but does not touch the floor. While there have been no water leaks to date (even in heavy rain), if there were the telescope raincoat would protect it from overhead water drips. The observatory sits on a concrete slab I made 150mm thick with 500mm deep 350mm square pier footings in each corner of the slab. The centre 1-metre of the slab is thicker, 200mm+, and the slab is reinforced with 2 layers of F72 (7.2mm) steel fabric, one layer near the bottom and one layer near the top of the slab. I ordered the concrete for the slab to be a high strength mix, meaning that the concrete supplier will use more cement in their mix than usual. When these types of slabs begin to dry they have the appearance of looking greenish due to the higher amount of cement used in the concrete, this adds to the expense of the slab but the strength will much higher than that of a normal slab. 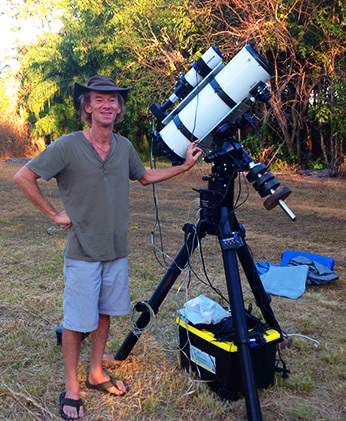 Above is a picture of Paul with our 8-inch diameter f/4 telescope that we use during our night sky expeditions into the Outback. 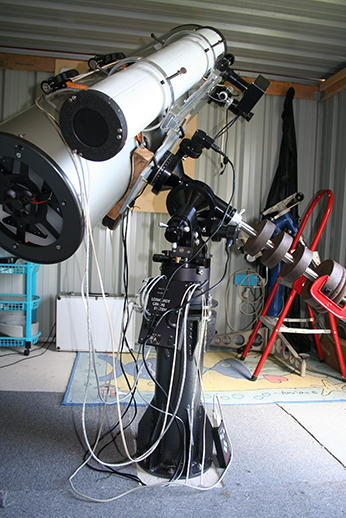 The telescope made by GSO Optical is a 8-inch diameter f/4 telescope mounted on a Losmandy G-11 mount equipped with Gemini Goto servo motors. The telescope pointing is controlled by STAR Atlas:PRO Astronomy Software running on a nearby laptop computer. The autoguider is a thermoelectrically cooled SBIG ST-402 CCD camera mounted on a 80mm guidescope. Autoguiding is controlled via a USB connection using SIBIG CCDSoft software. The imaging camera is a 8 Mega-pixel thermo-electrically cooled Canon 350D Digital SLR camera. While were in the outback we use a 120-Amp Hour battery to power the telescope and camera gear during the night, and solar panels to recharge the battery during daylight.